San Francisco's skyline has a handful of famous landmarks dotted around the city—the Transamerica Tower, the Painted Ladies, the Golden Gate Bridge—but the most visible might be Sutro Tower, standing 977-feet-tall on Twin Peaks since 1973. 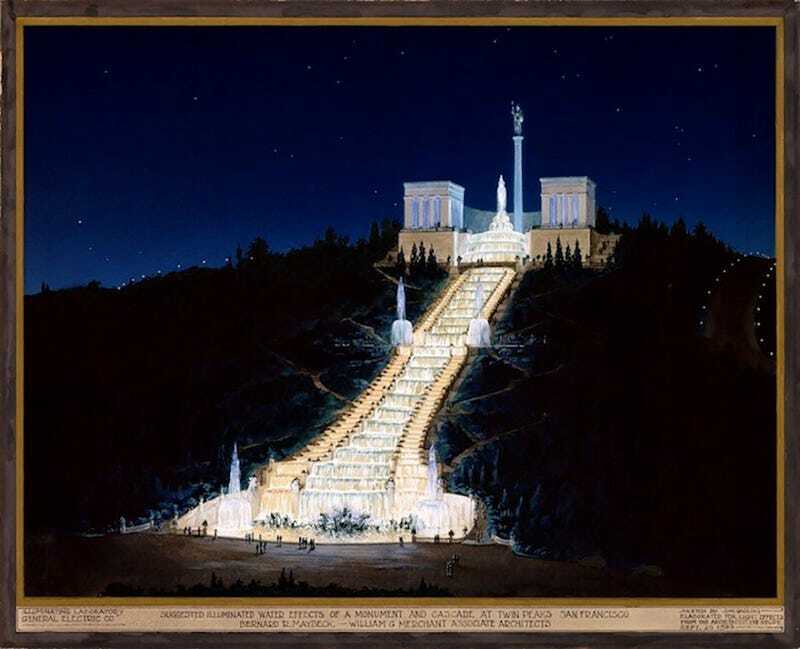 As icons go, it's definitely got the minimal, industrial-chic vibe going on—essentially the complete opposite of this ambitious 1933 plan for an illuminated monument and water feature cascading down the hillside. Whaaaa?? The Bold Italic unearthed the image, which was an unrealized part of Bernard Maybeck's neo-classical urban fantasy. The Bay Area architect designed the Beaux-Arts Palace of Fine Arts in the Marina, which is still a lovely, if not anachronistic, local architectural gem (and common movie backdrop). I honestly can't stop staring at this illustration. Even with the precedent, it seems improbable at best that Maybeck thought he could actually swing this. I mean, it's just so… opulent. It's bold in a way that seems at odds with the colorful, quirky Victorians and Edwardians that line so many of San Francisco's streets, and somehow, strangely, aligns more with the oversized and über-shiny new developments soon-to-be dotting (or dominating) Market Street. I can only imagine an SF where, every few decades, a spate of immense, glimmering structures go up in place of the grubby middle bits, which will eventually be scrubbed away entirely. Surprisingly, Maybeck's proposal was not actually the first of its kind. Architect and planner Daniel Burnham proposed this Athenaeum to top Twin Peaks in 1905, a concept that was derailed in part by the massive earthquake that decimated pretty much everything in 1906. And here's another kindred concept from architect Henry Sewell in 1926.